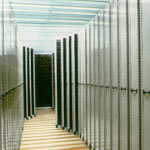 At RTI, we operate with a very basic premise: since storage systems are our only business, and the acquisition of your storage system is only realized once, it becomes our obligation to provide the best materials, planning, coordination, delivery and installation that over 50 years of experience can offer. Our uniquely trained staff of representatives and designers, along with our manufacturing, delivery, and installation crews, fulfill this obligation. If a project is only to be completed once, let RTI Shelving Systems guarantee that it's done right.